The Body Confidence Diet is a weight loss program created by Mark Macdonald, nutritionist, personal trainer, fitness model and founder of Venice Nutrition, a fitness chain with over 350 centers in America. According to Macdonald the key to successful weight loss involves maintaining stable blood sugar levels because this inhibits the process of fat storage and helps to maintain lean muscle. Achieving this balance turns your body into a calorie-burning machine. At the beginning of the book you will identify the reasons why you want to lose weight. You are then guided through the steps you need to take to achieve your goals. This involves paying attention to diet, exercise, sleep, and stress management. Regular Meal Intervals – Eating small and frequent meals is essential to provide your body with consistent fuel. You should also be sure to eat a small meal within an hour of waking and an hour before you go to sleep. Proper Nutrition Ratios – Protein, fats and carbohydrates should be in the correct balance in every meal. Calories – Each meal should contain the appropriate amount of calories. You should avoid consuming too many or too little calories. The eating plan is similar to The Zone Diet with each meal containing about 250 calories. A variety of menus are provided with different amounts of calories to suit men and women with different activity levels and requirements. Other aspects of Body Confidence include setting short and long-term goals, focusing on body fat percentage rather than weight, and reprogramming your metabolism. You will learn how to optimize your performance with nutritional supplements and a balanced lifestyle. Salmon, tuna, chicken breast, turkey, Canadian bacon, egg whites, whey protein, light cream cheese, string cheese, low fat cottage cheese, fat free Greek yogurt, Boca burgers, oatmeal, brown rice, whole grain bread, potatoes, natural peanut butter, raw cashews, apples, banana, strawberries, blueberries, spinach, broccoli, asparagus, tomato, lettuce, light mayonnaise. The Body Confidence Diet says that exercise is important, but it is not necessary to spend a large amount of time at the gym to get results. Exercise is what activates your muscle to burn fuel and it is a vital component of Venice Nutrition. The book outlines two different types of cardio exercise. Fat burning cardio involves aerobic exercise that is performed at low intensity for a prolonged period. High intensity cardio involves short periods with intense exertion. Strength training and core exercises are also recommended. 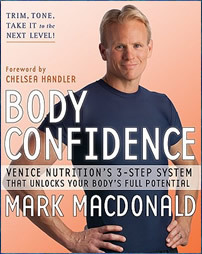 Body Confidence: Venice Nutrition’s 3-Step System That Unlocks Your Body’s Full Potential retails at $26.99. Venice Nutrition also offers an online program for $19.95 a month. Personal consultations are also available at one of their 350 centers in the United States or via phone calls. Includes a sample meal plan with varying calorie levels. Simple to understand and meal preparation is easy. Frequent small meals help to alleviate hunger. High protein intake reduces appetite and maintains muscle mass while on a reduced calorie diet. Body Confidence encourages regular exercise. Includes inspirational weight loss success stories. Requires monitoring of calories and weighing food. The Body Confidence meal plan is lacking in variety. Some dieters may prefer not to eat and prepare food six times a day. Exercise routine requires quite a large time investment of one to two hours, five days a week. Does not provide many options for vegetarians. Does not include any particularly new information. Body Confidence by Venice Nutrition is a weight loss program that is based on the idea that creating stable blood sugar is the key to successfully losing fat and changing your physique. The methods outlined in this book will provide valuable education to inexperienced dieters and will appeal to those who prefer to follow a structured meal plan.